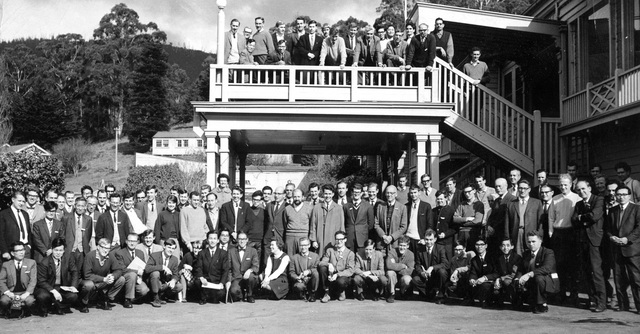 Participants at the 1965 Australian Conference on Microscopy and Microanalysis at the Mayer Chalets in Warburton, Victoria. 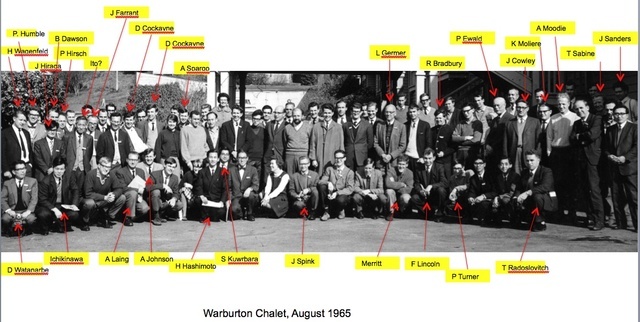 Crystallographers present include Bruce Hyde and Judge Bevan (top deck); Jimpei Harada, Colin Kennard, Alex Moody (standing); Andrew Johnson, Frank Lincoln (squatting). Also present: P. P. Ewald, L. Germer and John Cowley. A separate identification key names the following individuals at ground level: H. Wagenfeld, P. Humble, J. Harada, B. Dawson, P. Hirsch, ? Ito, J. Farrant, D. Cockayne, A. Spargo, L. Germer, R. Bradbury, P. Ewald, J. Cowley, A. Moliere, A. Moodie, T. Sabine, J. Sanders, D. Watanabe, Ichikinawa, A. Laing, A. Johnson, H. Hashimoto, S. Kuwabara, J. Spink, ? Merritt, F. Lincoln, P. Turner, T. Radoslovitch. A separate identification key names the following individuals on the balcony: T. Parkes, A. Head, A. Podjarny, P. Fisher, M. Loretto, A. Amelinckx, B. Hyde, D. Bevan. Identification key for participants at the 1965 Australian Conference on Microscopy and Microanalysis.